There is a rich history of protest music in this country, and these songs have carried social movements and inspired change. In celebration of One Book, One Chicago, I'll highlight some noteworthy protest songs. "Strange Fruit," which was originally a poem that became a song, was first recorded by Billie Holiday in 1939 and would be her best-selling recording. It's a protest song about lynching of African Americans. Hear Billie sing "Strange Fruit" on Billie Holiday. 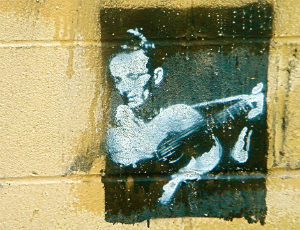 Woody Guthrie, with a guitar that read "this machine kills facists," was a folk singer with a number of protest ballads who inspired later socially conscious-musicians including Bob Dylan, Joan Baez and Bruce Springsteen. Listen to "This Land Is Your Land," "Do Ri Mi," "Ludlow Massacre," and "Union Maid" on Ramblin' Round. The Civil Rights movement inspired a number of protest songs, including songs by the Staple Singers such as "Long Walk to D.C." featured on The Very Best of the Staple Singers. There's also Curtis Mayfield and The Impressions' "People Get Ready" included on The Anthology. Nina Simone's "Mississippi Goddamn" was a response to the murder of Medgar Evers in Mississippi and the church bombing in Alabama that killed four little girls, and it can be heard on The Definitive Collection. Many protest songs were written in response to the Vietnam war including Creedence Clearwater Revival's "Fortunate Son" included on The Long Road Home. "War" has been sung by a number of artists, but Edwin Starr's version, which was a hit in 1970, can be heard on More Motown Classics Gold. Hip-hop artists have penned some iconic protest songs, too. Check out Public Enemy's "Fight the Power" on Fear of A Black Planet. And check out Kendrick Lamar's "Alright" on To Pimp A Butterfly that has been associated with Black Lives Matter. For more protest songs, check out our list. What's your favorite protest tune?